Nick Koudis started out in NYC. As a charter photographer at Getty Images, his stock images have since been published worldwide. 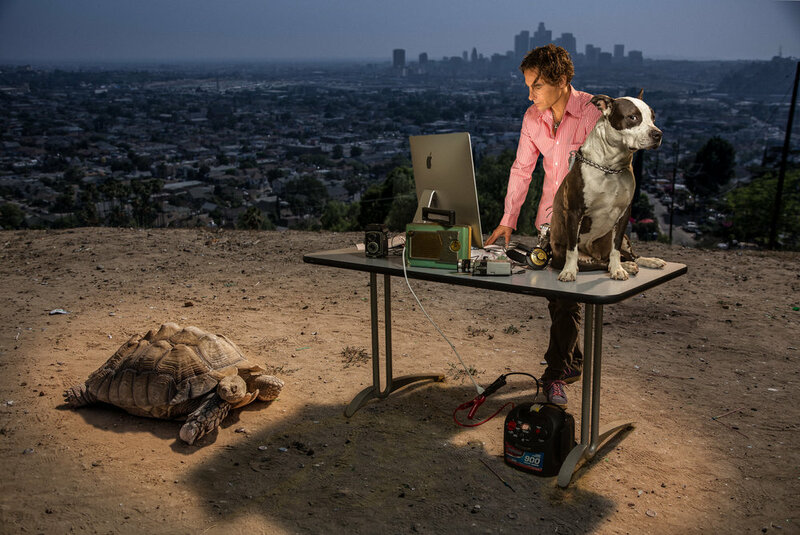 On assignment, he’s photographed multiple covers of Time magazine and since 2000, he has been photographing celebrities in Los Angeles, where he now resides. His work has received the One Show award, Andy Awards for advertising, PDN/Nikon Awards, among others. We spoke to him about the twists and turns of his career and what keeps him motivated today. Can you introduce yourself? Where are you based? I am Nick Koudis. My specialty or my passion is for humorous conceptual style images. I cut my teeth In NYC for 20 years, then escaped to sunny LA in 2000 where I continue to shoot celebrity and advertising images. If my images have a thread, it’s the irony of them or that made-you-look double-take quality. My father (and my first influence) was a genius amateur photographer, a regular Vivian Maier! He was the first to put a camera in my hands, teaching me split-field focus on his Agfa KARAT IV rangefinder camera, shooting Kodachrome. (After his passing, I unboxed, edited and uploaded the best of his gorgeous shots to Getty Images (search “koudis vintage”). Which photographers have influenced you? I think that my dad was the first person to teach me irony. That creative man, while on one hand was fostering my art talent, was insisting on my becoming a dentist with the back of the other. I plodded my way through a pre-med program, only to escape it when he passed on. I did learn something from that experience. I learned to learn. I started gleaning everything I could from every possible arena. I learned every art I could, and every mechanical skill as well. As an example, I later combined those skills and created a model-making shop that gave me the ability to stand out from the competition by building my own props. After that, I got the bug really bad. In my teens, I spent every moment reading photo magazines and books, absorbing the images and analyzing the light like a fiend. I built a darkroom in a boiler room, and I think there was something in the chemistry — that smell — that implanted an indelible memory and left me hopelessly addicted. I then remember gleaning every detail from the Kodak Professional Photographic Lighting Techniques book, and becoming so frustrated I didn’t have the means to shoot these images, that I bought a cheap Toyo view camera, rented an old abandoned church, and used that as my first studio. This is where I took my career to the pro level. I’d go out and hustle any work I could, shooting bits of jewelry and circuitry for small Long Island retailers. What’s one of the more memorable experiences been in your career? My first real accomplishment was a poster for the American Cancer Society called The Smoking Gun, a cigarette that bends into a gun barrel. That won my first Andy Award. It was pivotal because it became an anti-smoking poster that was seen by millions. It was my first real understanding that as a visualist, I could change or even save lives. Needless to say, I didn’t save too many lives after that. I’ve shilled for every type of product there is. What has your career as a photographer been like and has it taken you anywhere interesting? My career is no different than most of us. It’s an up and down ride with exhilarating highs and joyless lulls. Working in the most competitive markets taught me early on—you have to be different—or else. It also taught me that rejection was something I had to live with and grow from. It taught me something else, the importance of diversifying. I constantly keep my eye out for business opportunities in the industry that will keep me in the creative world. In my spare time, I was Founding Photographer of Getty Images, CEO/CD at Portfolio Central, Founder of The Museum of Advertising NYC, I’ve consulted with Flickr, and was Founder/CCO of Foto Mofo. In 2000, after my accountant told me that my Getty royalties would set me free, I did the classic move; I auctioned my huge Nolita studio (including my dad’s KARAT), got in my Jeep with my fashion-model-girlfriend and a briefcase full of cash, and headed West. I rented a large ranch in the hills in Hollywood, where I shot celebrity portraits and advertising. It was the life. Until it wasn’t. How big of an impact has photography had on your life? For lack of ‘real’ religion, photography has been mine. I don’t want to sound cocky about it but I have trouble having any other thoughts at all. You know how, when you’re driving, you constantly scan the road for children and chickens? Well. I do the same thing. Constantly taking mental images in my search for the interesting. To date, my internal mental camera has 421,632,607 actuations. That’s the impact it’s had on my life. Every day I’m bombarded by the most incredible visuals. My daily visits to Instagram are just the start of it. Seeing all of the incredible imagery is what inspired me to start up Foto Mofo (currently in hibernation), I was seeing so many photographers who impressed me with how far they were willing to go to make their vision a reality. From the relentless Ian Ruhter, who converted a cube truck into a massive wet plate view camera, or someone like Scott Raymond Carter who charges a pounding wave just in the hopes of bringing us his literally breathtaking surfing images. In the three years since we put FotoMofo on hold, I miss those daily discoveries. But right now Instagram is ablaze with artists trying to outdo each other. Low pay for exposure is a real crime. Apple’s recent “shot on iPhone” gaffe, offering no pay for massive exposure, hopefully, has made us all more aware of this problem in our industry. The good thing is, the social media attacks on companies doing this seem to be escalating. The bad news is they will keep trying till there’s pushback again. We need to continue to act in the interest of our industry and of other creatives. Join an organization or group. My silly sarcastic point is that there’s nothing that ‘makes’ a great image. It’s you that makes the image great. And that poses the question, what makes an image great to you? If you are as passionate about whatever you shoot as you are of shooting it, that combo will win big. You will create images that will just ooze passion. What is it that you want to say with your photographs and how do you achieve that? I love creating the impossible, but realistically. My images often play with scale or odd juxtapositions. I love double takes. One image entitled, The Bridge of Putting Two Chairs Together – Communicate, at first glance looks like a normal bridge at night, is actually two chairs facing each other in what I saw as the best way to open a dialog. Of course, I use Photoshop to assemble the layers, but I’m very careful to match image resolution and lighting order to get the realism to the point I take it. I typically shoot the background plates first, so I can match light in the studio later. I also do most selections by hand. bit.ly/NKiBook is a link to a free iBook for iPad ‘how I did it’ book that explains the thought process and technical process for many of my photographs. What camera gear do you use? Anything you’d specifically like to recommend? I use Canon 5Ds 50MP and a Canon 6D is my daily driver, and use a Phase One when needed. I’m a huge fan of Canon gear. The interface, to me, is way more intuitive than Sony or Nikon, and the images, to me have a more analog feeling. I underline my point to remind you that there’s no right camera, only the right camera for you. I am a serious champion of Speedlight High-Speed Sync. What technology/software do you use to help you achieve your goals? Lightroom! Ninety percent of photography is organization. Lightroom Classic lets me do it in spades. I can ingest, process, organize, track, and share images. All in one place. I apologize to Adobe for all the bad things I’ve said in the past— right now they’ve got it sussed. Capture One. Not so much. In a studio environment, yeah. But Lightroom is my go-to for everything else. Modo from The Foundry. As the need to build physical props waned, I learned to use Modo to create and include CG elements into my images. I used it for the ambulance in “Ironic Death, Hit and Run by Ambulance”, the Smart Car in “Jack”, for two. (I helped design a photographic Studio Lighting Kit for Modo by taking HDR images of light modifiers and creating realistic lighting with them). Squarespace is my go-to site builder because it does an amazing job of preserving image quality. Plus it has an automatic portfolio for iPad. Do you consider copyright a problem and have you ever had a problem with people using your images without proper permission? Copyright isn’t a problem. But infringement sure is. I have had many cases resolved in the past. It’s an uncomfortable process, but sure beats living with the violations unchecked. Sadly, on any day, I can go to my Pixsy and see hundreds of unauthorized uses. Hundreds. It’s tragic. But it’s such a comfort knowing that Pixsy resources have got my back. You see, Pixsy is not just a search engine, it’s a network of legal teams eager to take on the infringers. What motivates you to keep taking photographs? Ironically, I get a lot of inspiration from my accountant. Have you got any great tips for aspiring photographers? What would your advice be to them? Shoot or get off the ‘pod! Get out there and shoot. Call a model, load your camera with pixels and go make your visions real. If you’re reading this, you probably have plenty of ideas and goals already. Go make them happen. Avoid microstock. Before you submit to the big G, do the numbers. Is your return going to be more than your effort? Or to put it another way, Is five days of pre-pro, shooting, post-production and keywording worth fifty bucks to you? Then, by all means, go for it. Realize that your creativity has value — even more if you file copyright. Promote. Love your work and remember that people need to see it. I know you’re probably tired of your existing work, but the world is waiting to see it! Protect yourself, your IP and your brand. Copyright your images, and use Pixsy to recover lost licensing revenue. Keep an inspiration folder (or swipe file) of 12 images that you would like your own work to look like. Every so often, replace the worst image with a better one. You’ll not only get a much better picture of who you are as an artist, but you’ll learn impressive portfolio editing skills as well. Break a rule every day. But not that rule. Read more trade secrets on my blog here. How can people support your work? I have a print site that you can visit. Or if you’re in LA, you can avail yourself of my coaching services. What are your future plans and where can we follow you? I’m gonna go shoot a great image. How ‘bout you? I’m @koudis on Instagram or koudis.com for the full picture.